It’s that time of year. Viruses and colds everywhere. 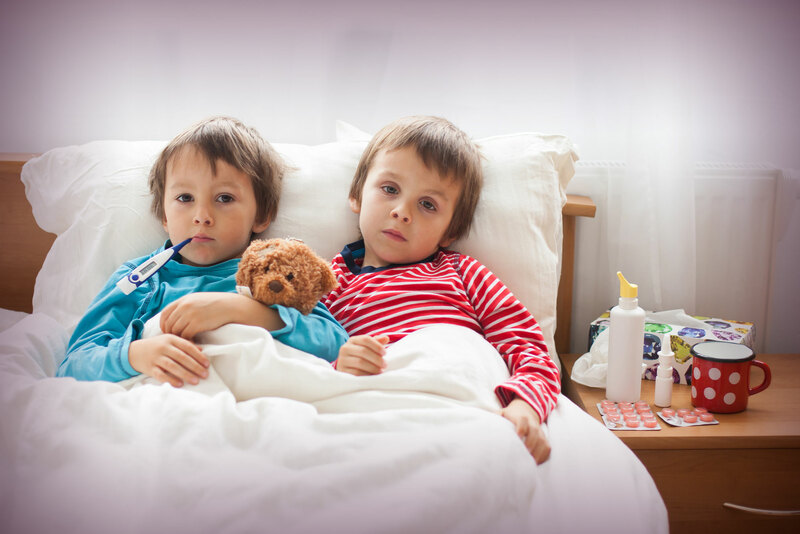 This time of year can be a source of frustration with sick kids and hectic schedules. There is no way to make these unwelcome house guests exit your home any more quickly, but there are things we can do to make your kid more comfortable. Is your house stocked and ready for the season? Get prepared with your own personal cold and flu survival guide. When the noses start running, you are going to need these in your life. Make sure you’ve got an extra couple boxes stashed away in the event of a whole family virus-fest. Several sick kids, a sick spouse, and only 1 box of tissues isn’t going to be fun. There are other options to replace the traditional kleenex if you are so inclined. Try a roll of the extra soft toilet paper to do the trick beautifully for less expense. Or if you’re feeling experimental, you can try flannel handkerchiefs. Turns out, you can find these on Etsy in all kinds of pretty patterns. (I have flowers and robots…allergies at my house are NOT nice.) Or you can make them yourself if you are good with a sewing machine. (I am not.) Bonus points here for washing and re-using. True, a tub of vaseline isn’t going to make your cold go away faster. But it WILL keep your nose and lips blissfully un-chapped. Once you start reaching for the tissues, dab a little of this on your nose and lips to prevent chafing. A little goes a long way. It doesn’t burn so kids won’t fight you. This is the number 1 item to have in your house for cold and flu season. Grab a handful and stick them in a drawer somewhere. Saline does magical things to thick snot. It loosens mucous so that it drains more easily and you can blow it out more easily. But it also helps decrease inflammation in swollen tender nasal tissues. A couple squirts in each nostril can really help you feel better. Saline is safe even in brand new babies. And you can use it as needed and every hour if necessary. But if you have an infant with a cold, go easy on the bulb suction. Using suction more than a couple of times a day can really irritate the sensitive tissue inside the nose and in some cases will make the congestion worse. Save the bulb suction for gobs of snot. Considerations for saline.. 1. generic saline is fine. 2. Label the saline container with the name of its user. (I understand that we’re family and all, but I don’t want to share boogies with my kids…) 3. If you’re having issues with the large tip working well with your little kid, you can try something like Simply Saline (link below)… it can be found everywhere. And it has a tiny tip which works better for tiny nostrils. Warning to all though… apparently there is a form of this with eucalyptus which I purchased on accident once. Youngest daughter did not appreciate minty freshness on the inside of her already irritated nose… you’ve been warned. Hot tea with honey is great for soothing sore throats. The steam helps open up swollen nasal passages. And the warm liquids help soothe the throat and melt away mucous. Peppermint teas can especially help open things up. If your kiddo isn’t a tea drinker, you can also try apple cider or hot cocoa. The effects will be similar. If your kiddo has an annoying cough and is over a year old, try some honey. A teaspoon of honey works better than most over the counter cough syrups without the medicine side effects. If you need more convincing, you can check out this study which was published in a 2012 Pediatrics publication. I love honey for my kids’ coughs. We don’t own a single cold medication. This should go without saying, but you need lots of fluids when you are sick. Blowing out gallons of snot is not good for keeping you hydrated. You will feel a lot better if you are hydrated. So bottoms up on that water. For little squirts who have upset tummies, pedialyte is the best for replacing fluids. It has less sugar than sports drinks. There are now many flavors to choose from and you can even get it in popsicle form. Which makes anything more palatable. There is something to be said for chicken noodle soup to help you feel better when you’re sick. The individual ingredients are not magical. But the combo definitely works. The salty chicken broth helps keep you hydrated. Warm soup going down the back of your throat soothes tickly throats and helps break down mucous in the back of your throat. Steam from the soup helps loosen mucous in your nasal passages. Granny was definitely right on this one. Soup does help you feel better when you’re not feeling well. Last Christmas, I made my children fleece rice-filled heating packs. They are soft and fuzzy and you pop them in the microwave when you want them. They were a hit. Cold toes? Rice pack to the rescue. Chilled? Same. Just feel icky and need some comfort? You know the drill. Turns out, these are great for helping you feel better. True, they don’t make your virus go away any more quickly than it’s going to go. But they do provide comfort. And that’s what we need when we have a nasty virus. By the same token, a cool pack can also help your kiddo feel better. My little squirt prefers a cold pack for a headache. Tylenol can also help, but she reaches for the cold pack as well. I hope that this cold and flu season treats your family kindly. Remember that most viruses can be treated at home. But if your little one seems much sicker than expected, they are having trouble breathing, funky rashes, or not keeping down fluids, get them checked out. If you’re not sure, call your doc for advise and next steps.